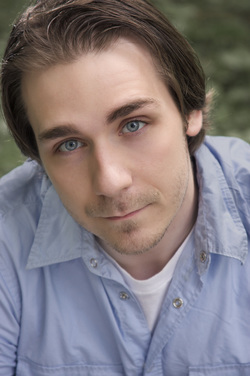 ﻿﻿Christopher Moore graduated as an actor from the John Abbott College Professional Theatre Program. For the past 10 years, Christopher has had the pleasure of working with several companies in and around Montreal, including Persephone Productions (Othello, Hamlet) Gravy Bath Productions (This Table, Oedipus Rex), Tableau D'Hôte (Haunted House), Montreal Theatre Ensemble (Of Mice and Men, All My Sons), Altera Vitae (Bent), Hudson Village Theatre (The Graduate), MSTC (Julius Caesar, Titus Andronicus) and Rabbit in a Hat (Penumbra, Cornered). Persephone Productions was one of the first companies Christopher worked with. He has collaborated often with this company, and in 2012 he became Persephone's Artistic Director. Christopher transitioned into directing several years ago and has had the pleasure of directing or co-directing many of Persephone's productions, including Spring Awakening: The Musical, Dr. Jekyll and Mr. Hyde, and Far From the Madding Crowd. Christopher finds time to direct for other companies as well, including: I Don't Know Where Here Is (Vanguard Productions), Bard Fiction (Beyond the Mountain), Hairspray (WISTA), and Julius Caesar (Montreal Shakespeare Theatre Company).